Meat, baked in the oven, much better for the body than pan-fried. Besides, it is not necessary to watch, that facilitates the work of Housewives. It is important not to overdo the meat in the oven, so it does not become too dry. Marinate meat before baking in the oven. Mix soy sauce with honey, add the lemon juice and spices. A piece of meat put in p/e package, add the marinade. Allow the meat to stand in refrigerator for a day. Coat a piece of meat with sauce, put in a closed dish. Leave for a few hours in the refrigerator. Lard marinated meat cubes, carrots and frozen fat. My piece of meat deep punctures, invest in them with cloves of garlic. Cut on a wooden Board a lot of greens, sprinkle it with sea salt. Spread the greens evenly over the Board. Roll it stuffed a piece of meat to greens stuck to its surface. Put a piece of meat on a heated pan and quickly fry it to closed the pores through which leaves the meat juice. Bake the meat in foil. Pack in foil roasted piece of meat. Place on a baking sheet so that the seam of the foil facing up. 15 minutes until cooked, open the foil, let the meat crispy. Cook the meat in the sleeve. Place the sleeve of the prepared piece of meat. Secure the ends of the sleeves to the meat juice from leaking into pan. If you want to get fried crust, then 15 minutes before the process is complete, pierce the sleeve top with a fork so the meat browned. If you want to get the meat in its own juice, then took out the pan from the oven, leave the meat in the sleeve to cool. Meat juices will be absorbed into the finished product. Place the marinated piece of meat on a baking sheet. Carrot roundels, cut, onion cut into large rings. Close the meat on top of a thick layer of chopped vegetables. Put in the oven and periodically pour released juice. If you want to check if the meat is cooked, pierce it with a toothpick. The extracted juice should be transparent, then the meat is ready. 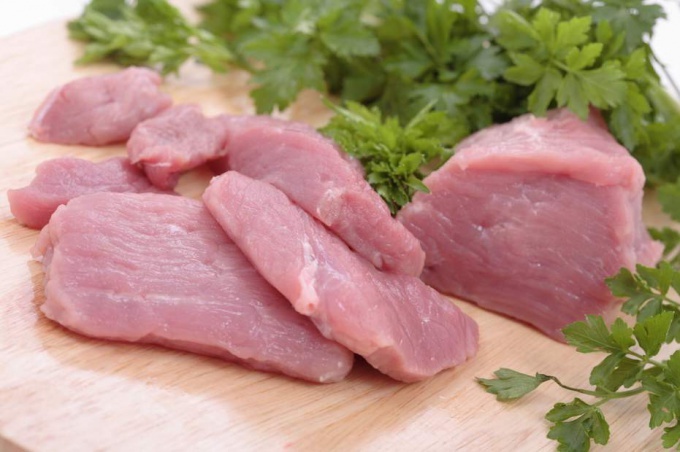 Boneless pork rasplatita, whisk culinary hammer. Brush all over with tomato paste and spices, leave to marinate. Make a stuffing with herbs and garlic. Roll a layer of meat in a roll and bake in the oven.